What does the phrase “Porte des Morts Passage” mean. Answer: Early French explorers to Door County were inexperienced regarding the dangerous currents between Green Bay (the body of water, not the city) and Lake Michigan. These currents were especially unpredictable and strong in the relatively narrow strait between the Door County peninsula and Washing Island–a distance of just over three miles. Why could Death’ Door Strait be called the Fresh Water Bermuda Triangle? What time of the year is Death’s Door Strait the most dangerous and why? Answer: From September to November winds and storms pick up all over the Great Lakes. In fact one of the most famous Great Lakes sailing tragedies was the sinking of the Edmund Fitzgerald, a 729ft. ore carrier (the largest on the Great Lakes) in Lake Superior off Whitefish point on November 10, 1975. Gordon Lightfoot’s song immortalized the ship and crew. The Door Strait is situated less than 30miles north of the 45degree latitude and places it squarely between cold dry arctic air and warm humid air from the Gulf of Mexico. When these air masses clash strong winds and storms can result. When seasonal change occurs (fall and spring) the prevailing westerly winds of this latitude combined with the east-west orientation of the Strait give winds a natural pathway to grow waves and currents across the 25 miles of open water between the Strait and Michigan’s Upper Peninsula. What is the “seat” of Door County? Answer: Sturgeon Bay, a city of about 10,000. It is located in the southern end of the county and was known for its ship building history although today pleasure boats far outnumber commercial vessels. These can often be seen when crossing the high Sturgeon Bay bridge carrying hiways 42 and 57 and bypassing the downtown. Sturgeon Bay (not the city) is a natural bay almost disconnecting the northern portion of Door County from the greater Wisconsin land mass. In 1881 a 1.3 mile canal was dug allowing ships to pass from Green Bay (the city) to the open waters of Lake Michigan and thus avoiding the treacherous Door Strait and shortening the trip to Chicago by almost 70 miles. Note: Sturgeon Bay is home of the Door County Visitor’s Bureau and has a great information center on Highway 57/42 just before the exit to downtown. 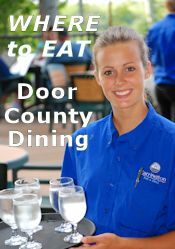 What commendation did Midwest Living Magazine award to Door County? Who needs New England? The Midwest has its own coastal charm around the Great Lakes, and our top towns, located in Door County, are the best examples of it. The 80-mile-long Door Peninsula extends into Lake Michigan on Wisconsin’s east side, creating more than 300 miles of coastline. Tucked into this shore are lighthouses, 30 beaches, five state parks, golf courses and pretty towns seemingly plucked straight from a painting. Along the busier Green Bay side, it’s hard to tell where one white clapboard village wrapped around a blue harbor ends and another begins. But Ephraim (population: 349) and Fish Creek (population: 200), bookends to Peninsula State Park, epitomize what’s most appealing.